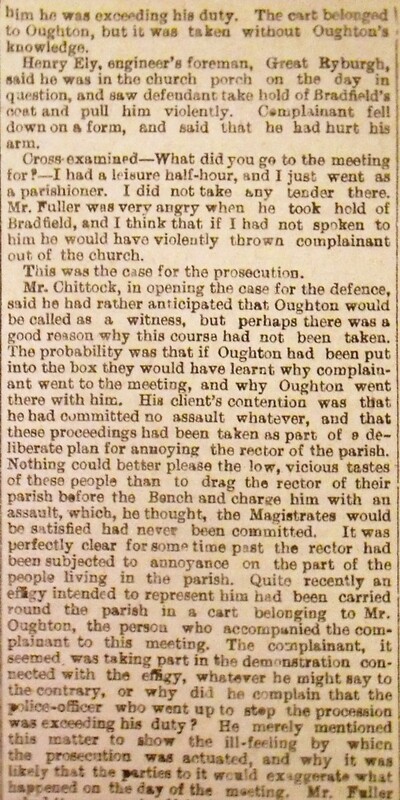 A Norfolk Rector Charged with Assault. On Monday at Fakenham Petty Sessions, the Rev. 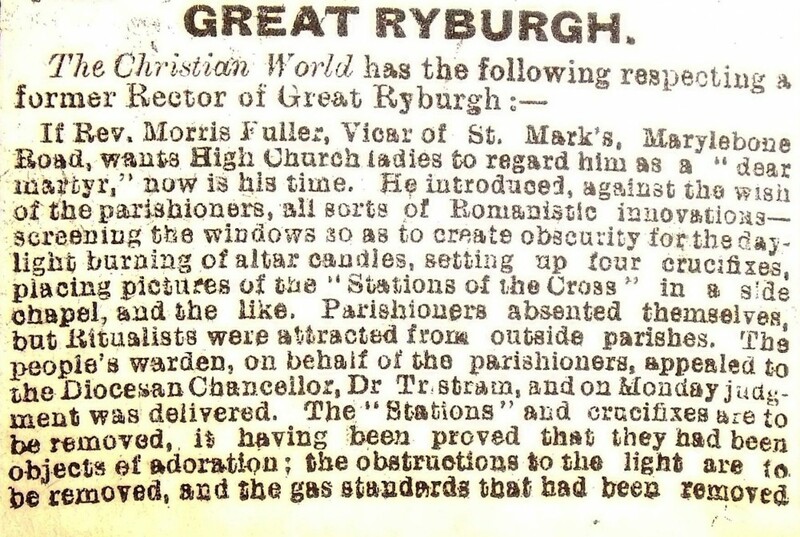 Morris Joseph Fuller, rector of Great Ryburgh, was charged with unlawfully assaulting Gladwin Lewell Bradfield, assistant overseer of Ryburgh, on December 24th. The case attracted a good deal of attention. There were solicitors on both sides. The complainant was called. He said that on Christmas Eve, in consequence of a notice he saw on the church door, he attended a meeting in the vestry. The notice was in the Rector’s handwriting, and the meeting was to receive tenders for supplying coal. The Rector saw him in the porch, and said, “What do you want” Complainant replied that he had come to the meeting. 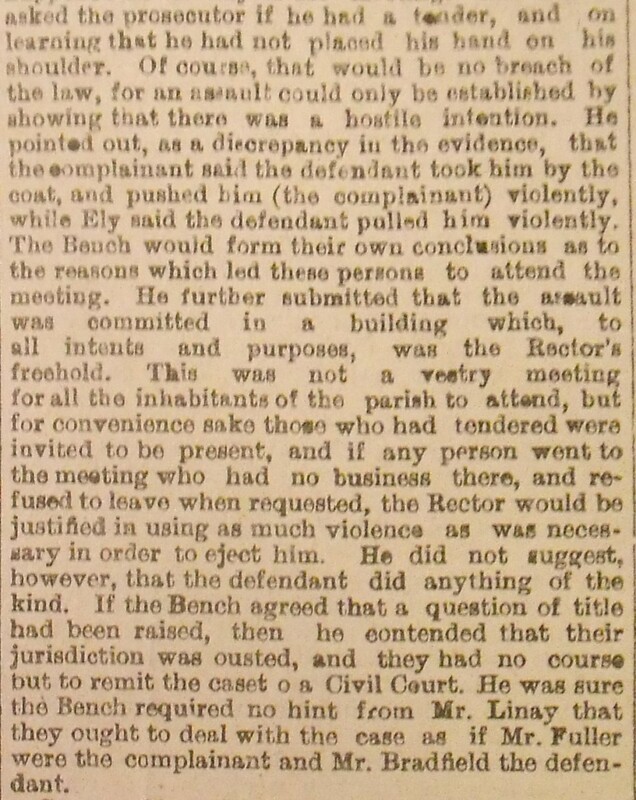 Defendant retorted, “You have no business here,” and seizing witness by the collar, pushed him violently, so that the witness fell upon a form.-Henry Ely corroborated.- The Rector’s churchwarden and the parish clerk were called for the defense.- After their evidence the Bench retired, and in a short time found that an assault had been committed, but of too trivial a nature to warrant conviction. They also thought that the complaint was not bona fide, and that the case. 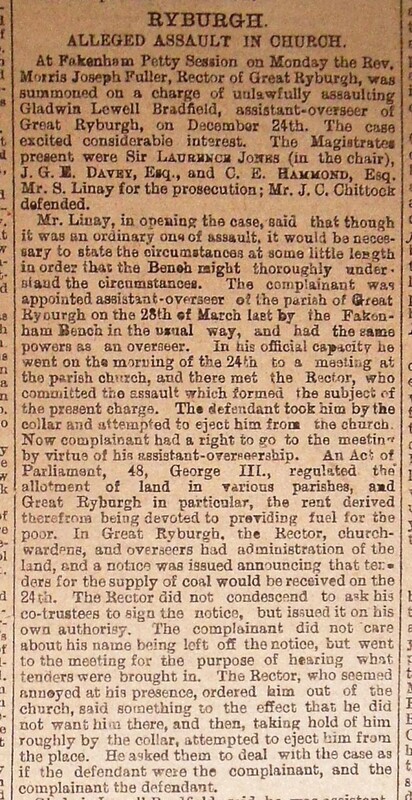 At Fakenham Petty Sessions on Monday week a case was heard in which the Rev Morris Joseph Fuller, rector of Great Ryburgh was summoned for unlawfully assaulting Gladwin Lewell Bradfield, assistant-overseer of Great Ryburgh, on December 24th. The bench considered the case was of so trivial a nature that they refused to convict, expressing the opinion that the case would never have been brought forward but for the ill-feeling existing in the parish. Pursuant to a notice calling a meeting of ex-officio members, & after receiving instructions from the Lord Bishop of the Diocese to do so, to fill up vacancies on the school committee. The meeting took place at the Rectory on Wednesday Dec 18th. 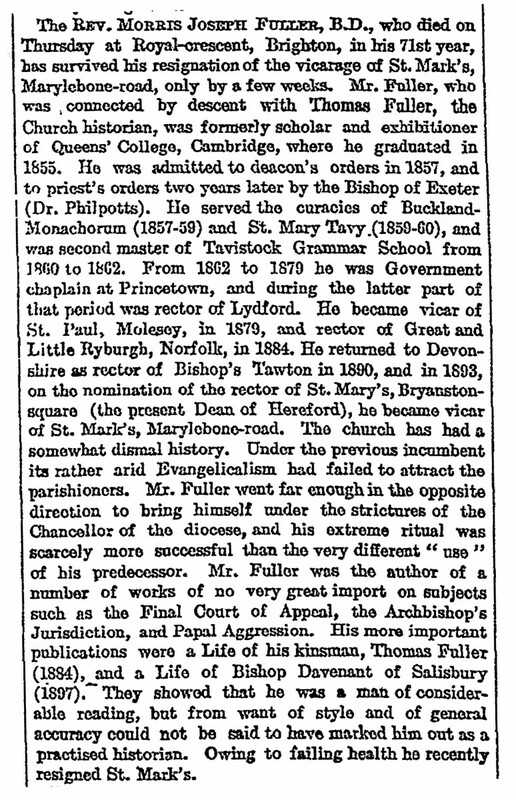 The Chairman, in opening the proceedings explained the nature of the trust deed, and also gave a short account of the interview which he had had with the Bishop at the Palace the previous Friday – when his Lordship instructed him to convene a meeting of the ex-officio members – to fill up the vacancies on the Committee. 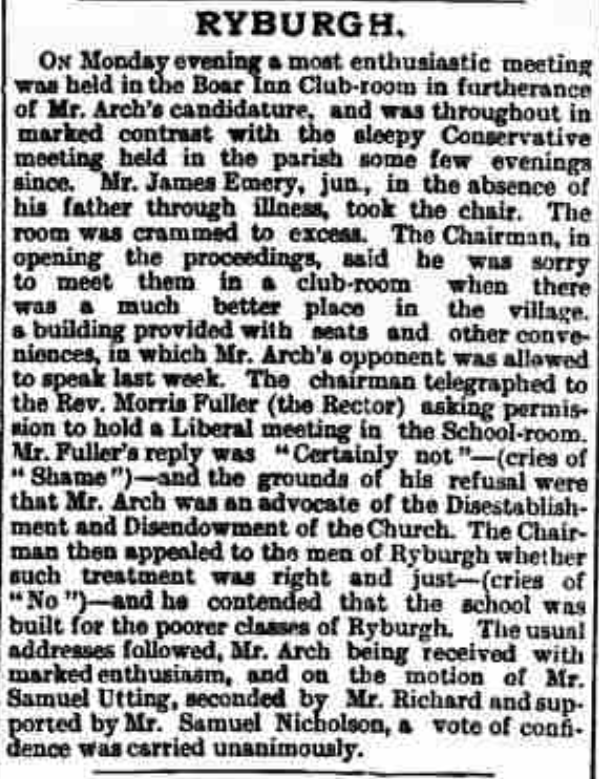 The Chairman said that there had been two vacancies by the deaths of the late Messrs M. Mesney and John Bell, and now there was a third by the resignation he was grieved to say, of their valued and long time friend (and who belonged to the Committee before he came to the Parish) Mr Francis from whom he had heard that very morning. The Chairman then proceeded to read Mr Francis’ letter to the meeting, in which he regretted that owing to the spirit shown to the personalities indulged in, he could no longer remain on the Committee, therefore begged leave to retire. “ I ? do solemnly himself declare that I am a communicant of the Church of England” this was the present tense- not the past or future. They would now proceed to the election. The Chairman added that the Bishop had suggested if properly qualified male persons could not be found, that ladies should serve on the Committee. 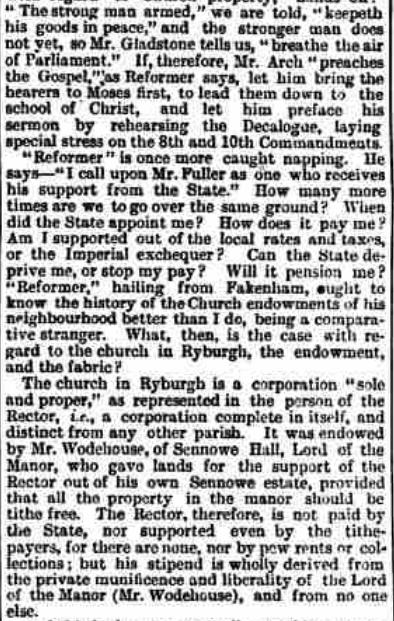 The Chairman was putting voting papers round the table to take the members [votes] when Mr Cooper rose and said there was no use in taking that trouble as he held 44 proxies for himself and Mr Mesney which would place them at the head. 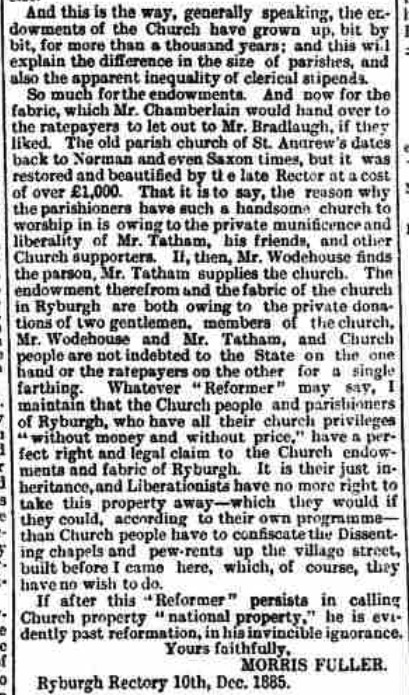 The Chairman challenged their right to become members of the Committee, as never having seen them inside the church, he didn’t understand how they could be communicants. Messrs Cooper and Mesney refused to answer questions put to them as to when and where they last communicated. PRESENTATION TO THE RECTOR.- On Sunday the Rev. Morris Fuller preached farewell sermons at the morning and evening services. He said he was sorry he was leaving the parish; but owing to the great amount of ill-feeling existing against him, he was obliged though reluctantly, to go, and place a curate to take charge of his flock, who, he hoped would be more appreciated than he had been. 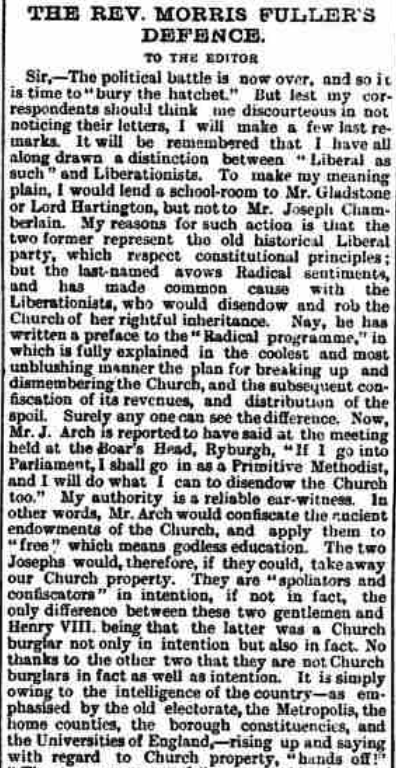 On Wednesday Mr. J.P.Symonds, his late Churchwarden, waited upon the Rector and Mrs Fuller, and presented them with a beautiful silver egg stand and toast rack, subscribed for by several friends in the parish and Stibbard admirers, wishing them every happiness in their new field of labour. The kindness of Mrs. Fuller to the poor and needy will be greatly missed, as she was ever ready to help them.